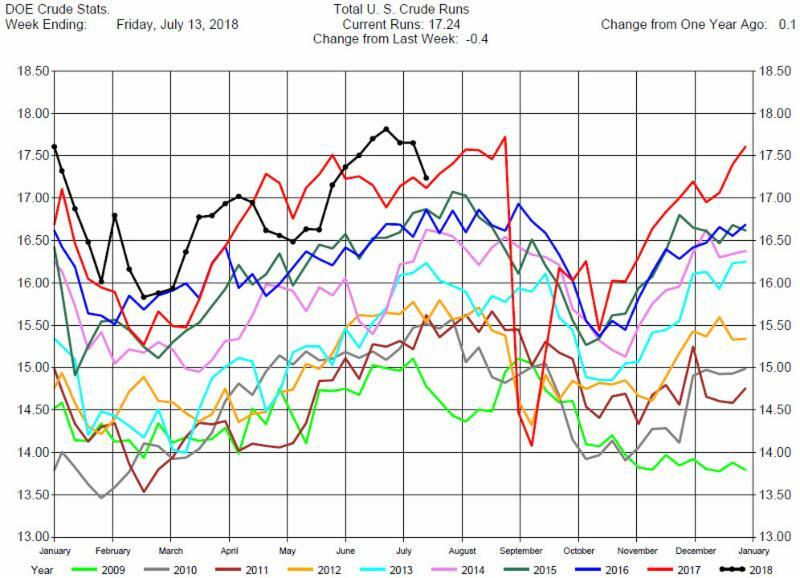 The DOE reported Total Crude Oil Inventories increased by 5.8 million barrels to 411.1 million barrels for the week ending July 13, 2018, expectations average was for a 3.3 million barrel decrease. Overall hydrocarbon supplies increased by 6.0 million barrels to 1,206 million barrels. 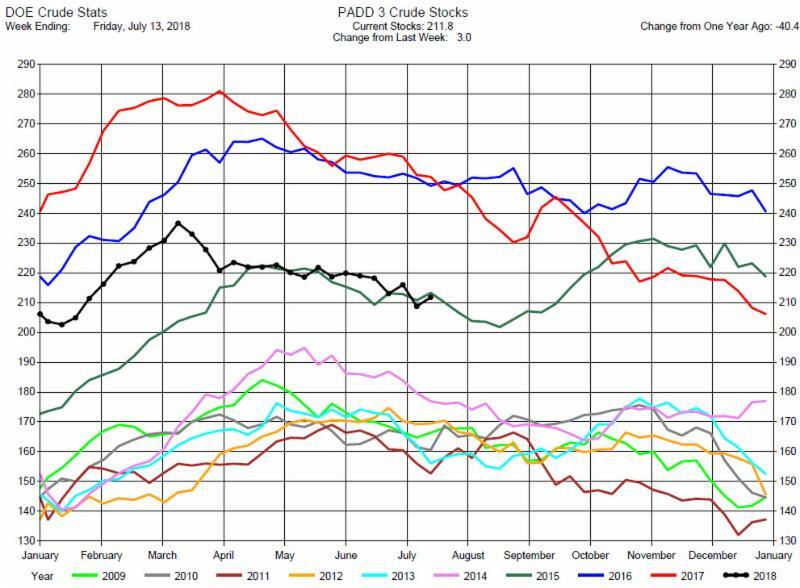 Crude Oil Production increased by 100,000 barrels per day to 11.0 million barrels per day. 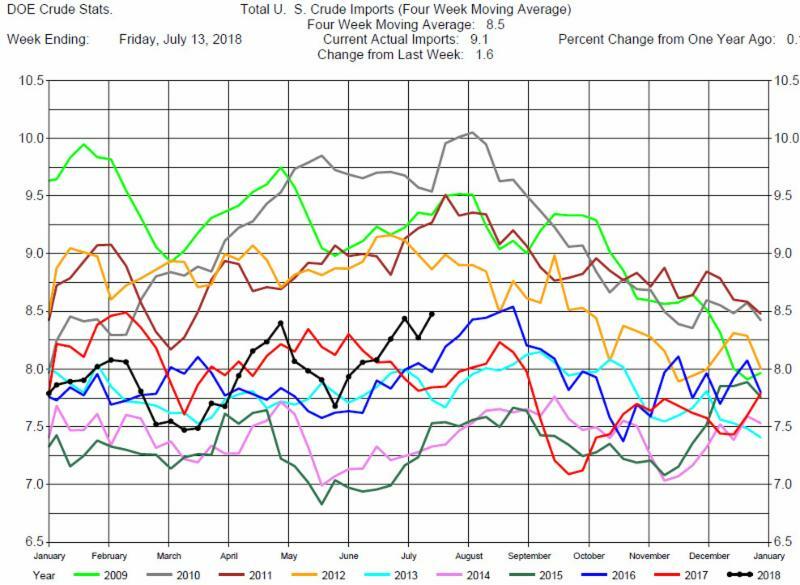 Total Crude Imports were up by a significant 1.6 million barrels per day to 9.1 million barrels per day. 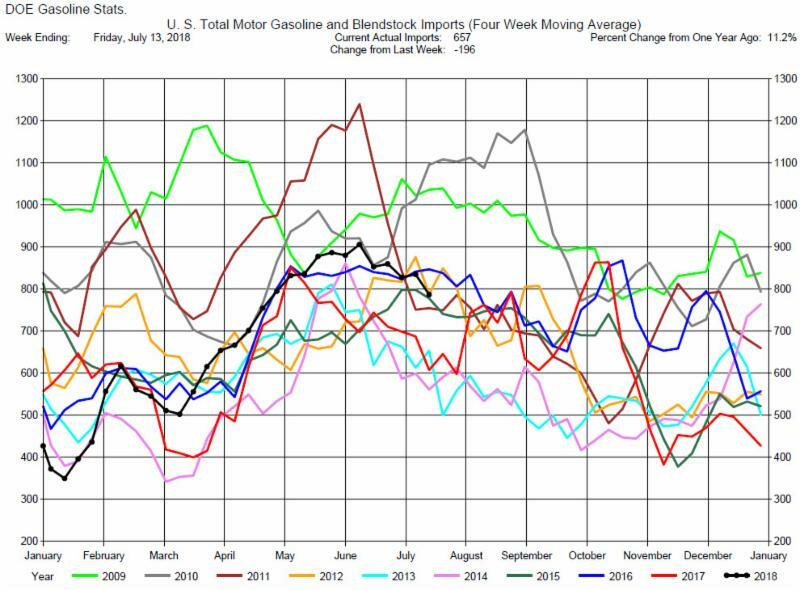 The large imports contributed to the Crude Oil Stocks build. Total Refinery Crude Runs down 400,000 barrels per day to 17.24 million barrels per day. 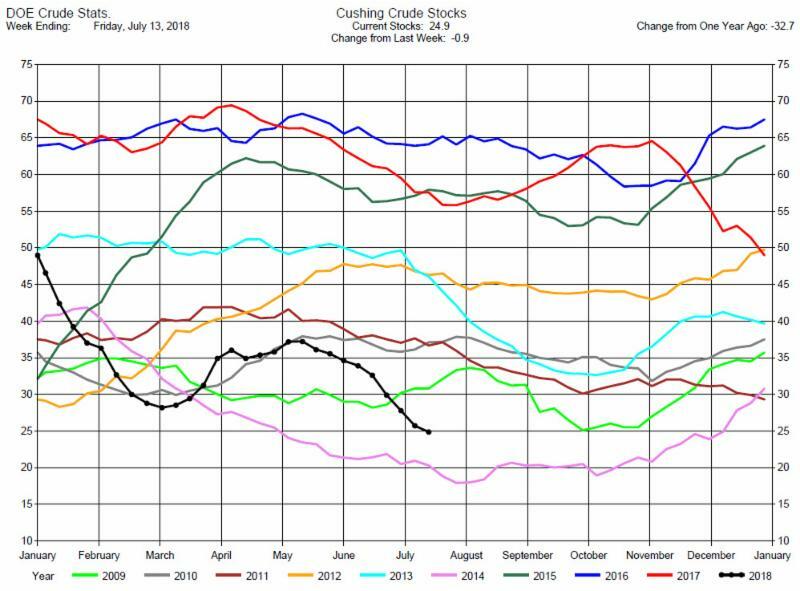 The decrease in Crude Oil Runs also contributed to the Crude Oil Stocks Build. 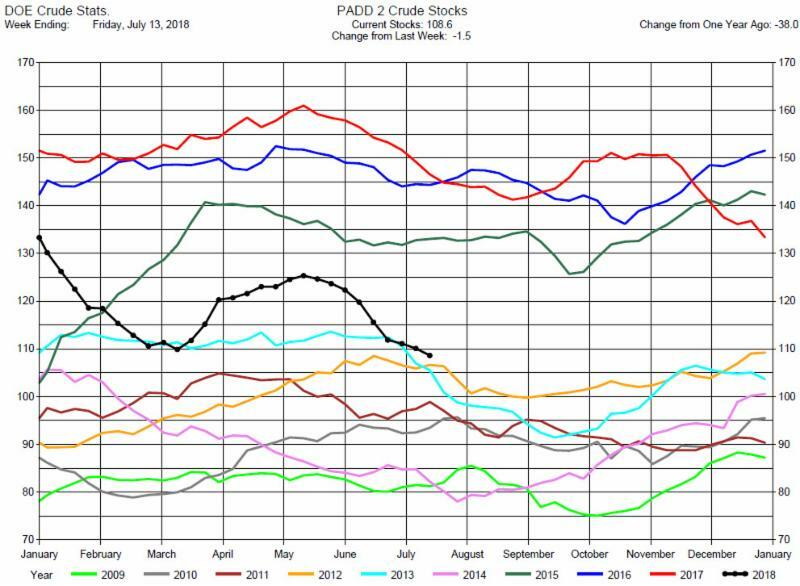 Despite the surprising large build in Crude Oil Stocks, the market rallied after a short lived fall. The market initially dropped by $1 with the release of the report but then rallied into positive territory throughout the trading day, closing near the highs, up over 65 cents. A recent International Energy Agency report reduced estimated global crude oil demand growth to 1.3 million barrels a day from 1.5 million barrels a day. In addition, with the potential for increased supply from Russia and OPEC, many analysts are bearish on price. However, today’s price action suggests that the market is oversold or that traders are not bearish even though the DOE report was fundamentally bearish. We recommend traders remain on the sidelines given the conflicting information from price behavior and fundamentals. 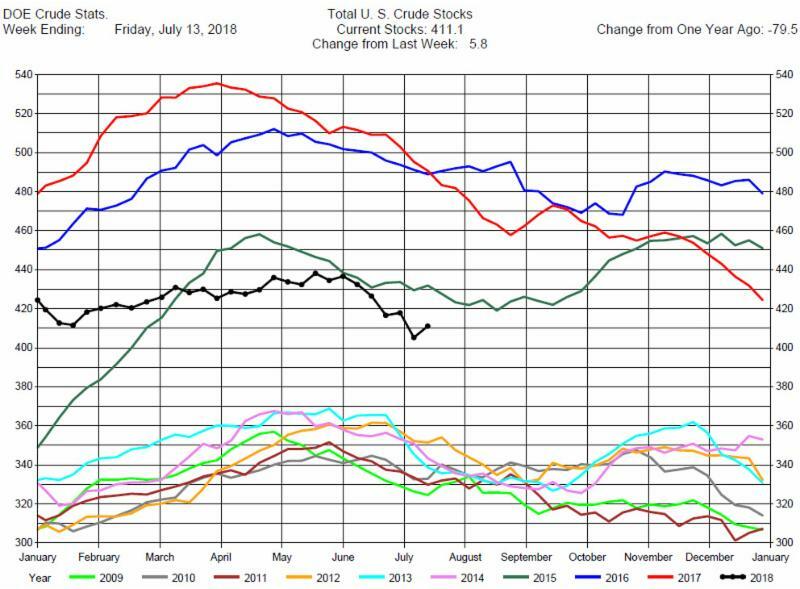 Total MotorGasoline Inventories decreased by 3.2 million barrels to 235.8 million barrels for the week ending July 13, 2018, expectations average was for a 400,000 barrel decrease. Implied Demand was up by 230,000 barrels per day to 11.40 million barrels per day. 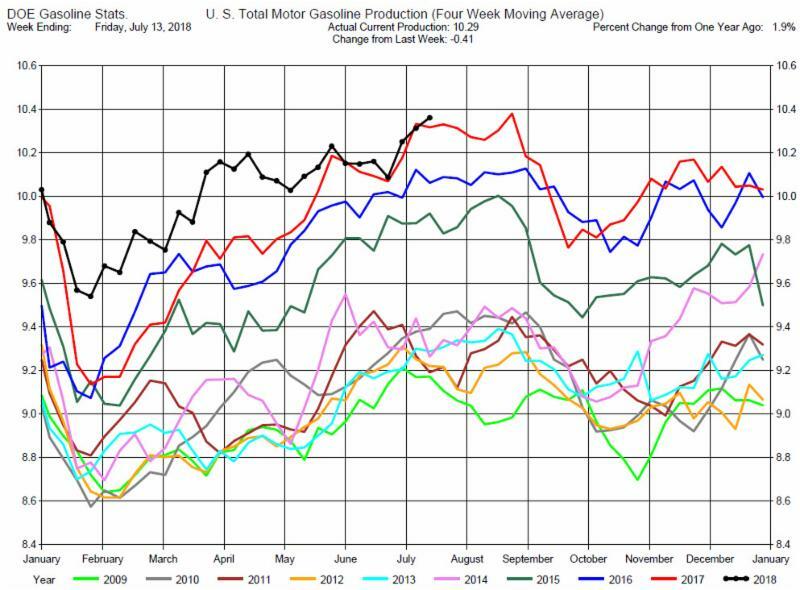 Gasoline Production was down by 410,000 barrels per day to 10.29 million barrels per day. 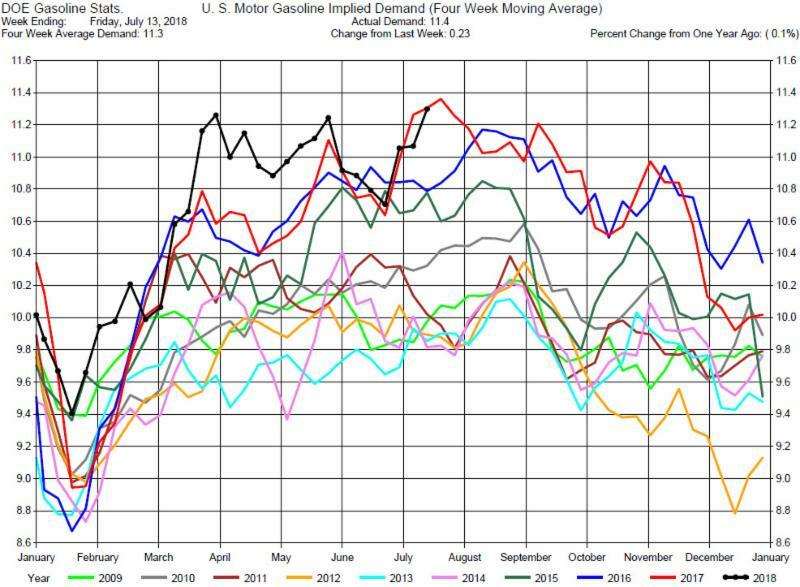 With Gasoline Inventories on the seasonal decline (with an unusually large draw in the latest DOE report) and demand at record levels, we view this as a bullish scenario for prices. 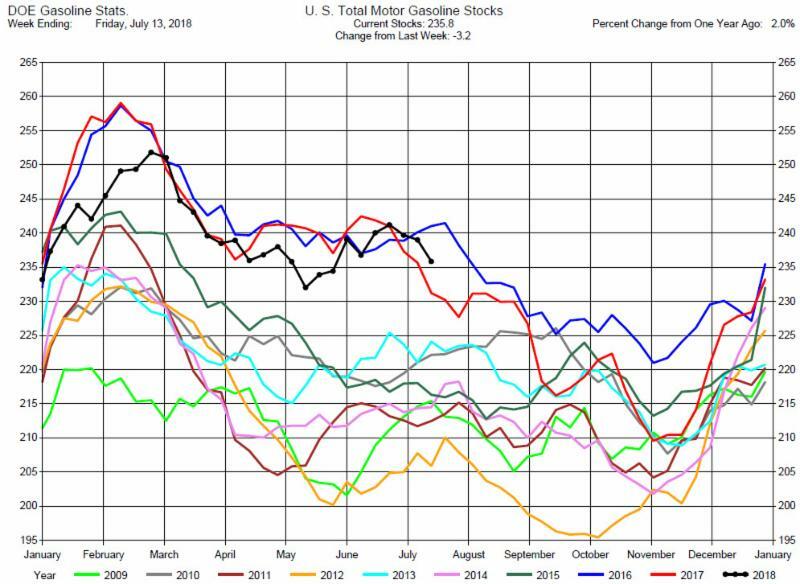 Crack spreads and calendar spreads declined with the recent drop in crude prices, however we believe this is an opportunity to take bullish positions in the Gasoline cracks or calendar spreads. 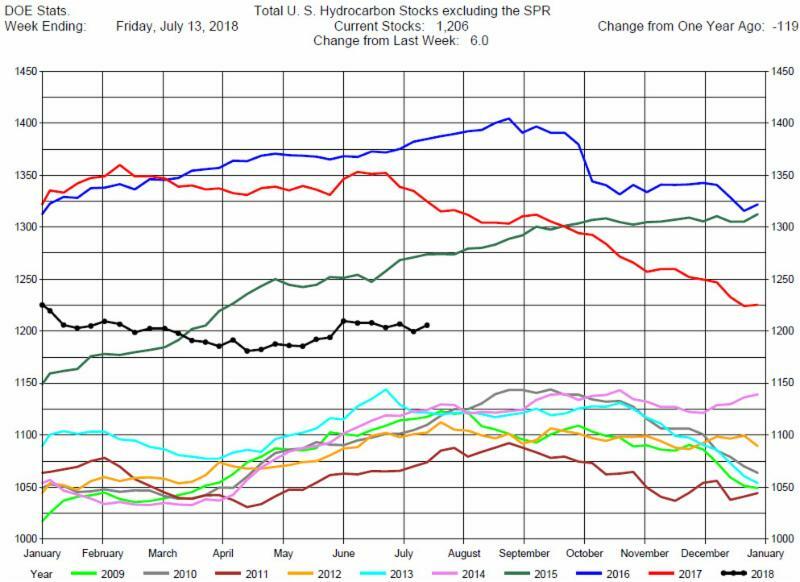 Total Distillates Stocks decreased by 400,000 barrels to 121.30 million barrels for the week ending July 13, 2018, expectations average was for a 700,000 barrel increase. 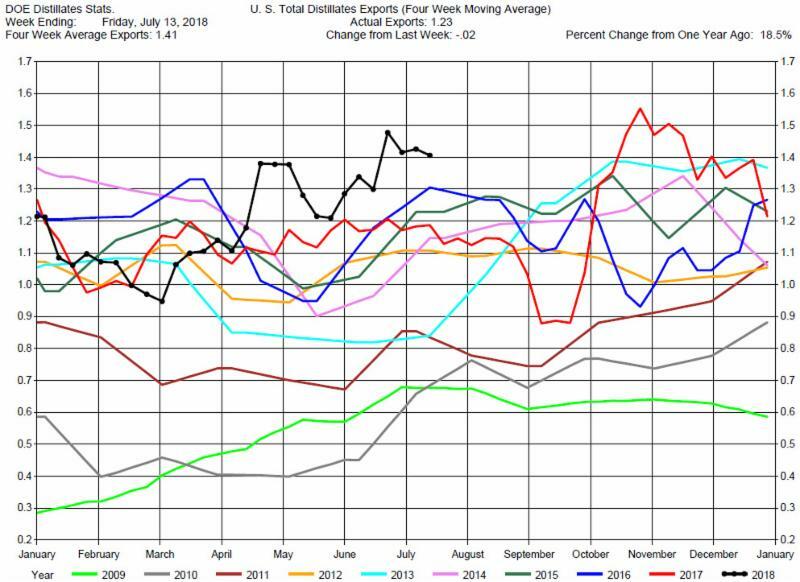 Total Distillates Production was down up by 270,000 barrels per day to 5.17 million barrels per day. 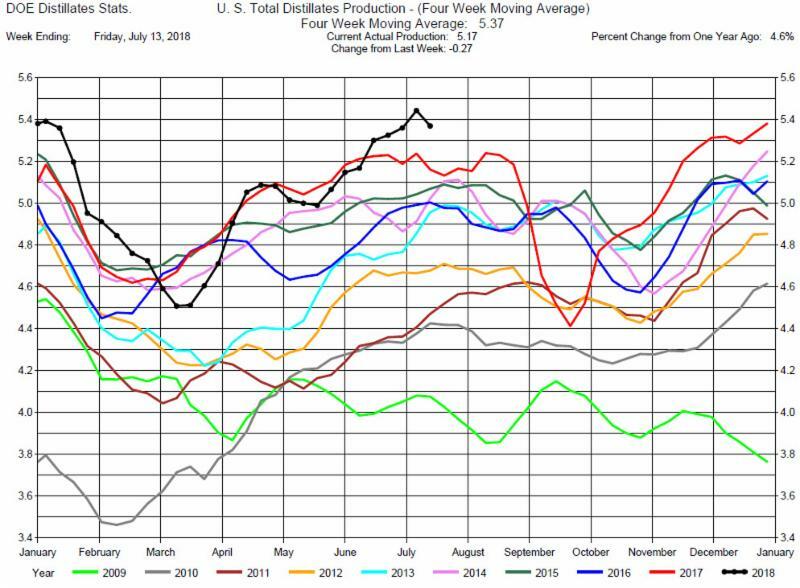 Despite decrease, Production remains at record levels. 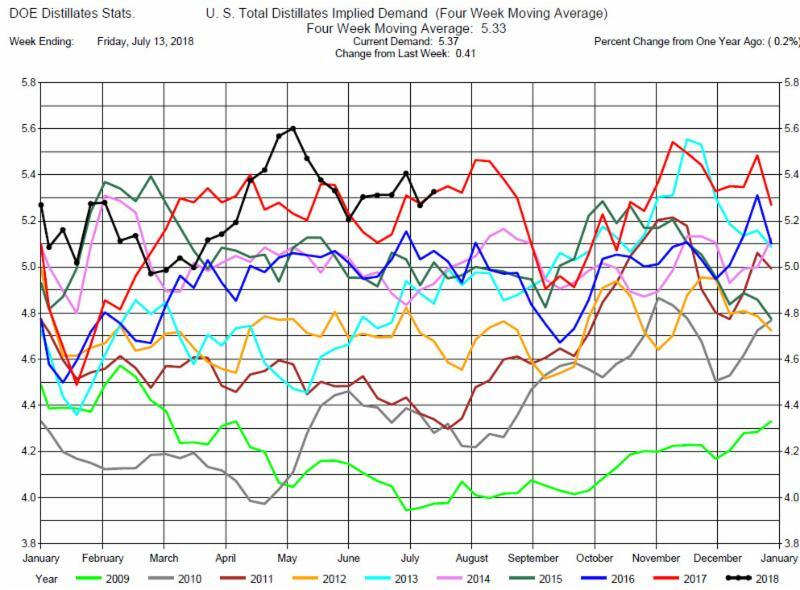 Total Distillates Implied Demand was up 410,000 barrels per day to 5.37 million barrels per day. 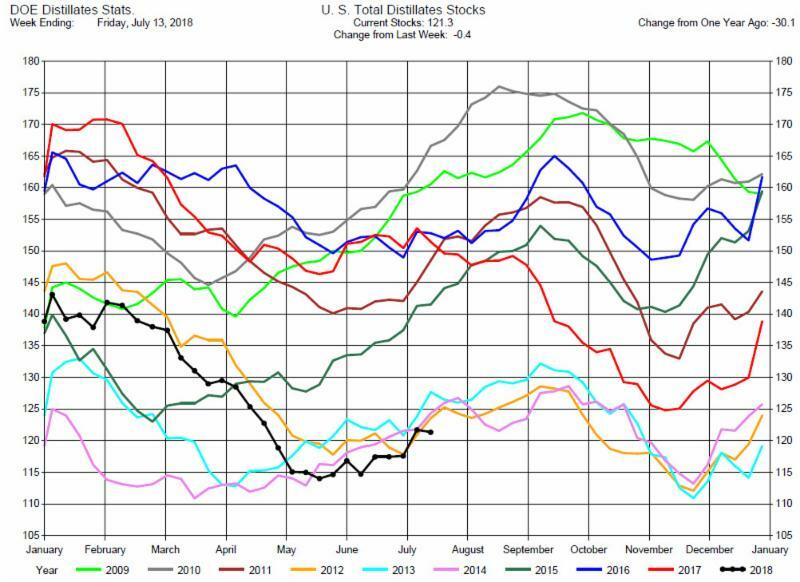 Even with record Distillates Production, Distillates Demand has been strong enough to keep Distillates Stocks at record lows. We view this as a bullish scenario and suggest traders consider Heating Oil cracks or calendar spreads as a bullish opportunity.